PulseBlasterDDSTM is a general-purpose, intelligent, programmable, RF and TTL/CMOS pulse/pattern generator system (USB board). The PulseBlasterDDSTM series of Intelligent Pulse Generation boards from SpinCore Technologies, Inc., couples SpinCore’s unique Intelligent Pulse Timing Processor core, dubbed PulseBlasterTM, with Direct Digital Synthesis (DDS) technology for use in system control and radio-frequency (RF) pulse generation. The PulseBlasterTM processor, implemented in state-of-the-art programmable logic, provides all the necessary timing control signals required for overall system control and pulse synchronization. By adding DDS features, PulseBlasterDDSTM can now meet all the excitation/stimuli needs of demanding users. 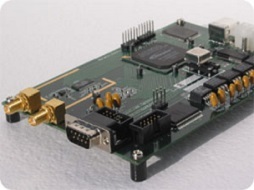 PulseBlasterDDSTM provides users the ability to control their systems through the generation of both digital control signals and fully synchronized excitation RF pulses from a small form factor PC board, providing users a compelling price/performance proposition unmatched by any other device on the market today. This figure presents the general architecture of the PulseBlasterDDS-I-300 system. The major building blocks are the DDS Core and the Pulse Programming and Timing Processor Core (PP Core). The DDS Core contains a Numerically Controlled Oscillator (NCO), 8 programmable phase registers, 1024 programmable frequency registers, the AWG (Arbitrary Waveform Generator), and the adjustable attenuator. The PP Core controls the timing of the gating pulses and provides the necessary control signals for frequency and phase registers. The DDS and PP cores have been integrated onto a single silicon chip. High performance DAC chips and high current output amplifiers complement the design. Generation of any frequency from DC (Direct Current) to 1/2 reference clock oscillator in milliHertz tuning steps (32 bit digital resolution)! Agile relative phase control using up to 8 programmable phase registers per channel, 12-bit phase resolution. Pipeline delay of only 3 reference clock cycles. Agile, phase coherent, "zero-time" frequency switching using 1024 independent frequency registers. Agile pulsed RF output, 13.3 ns resolution (300 MHz models). Easy tuning of frequency outputs. Greater immunity to parameter drift due to temperature. What does SpinCore's Intelligent Pattern Generation give users? Timing resolution of 13.3 ns with a 50 MHz external clock (NOTE: Timing resolution of 2.5 ns is available on non-DDS, TTL-only PulseBlasterESR boards operating up to 400 MHz). Memory space for up to 4k program words (VLIW, 80-bit wide). External hardware and software triggering. 3.3 V digital TTL/CMOS outputs, 25 mA per pin. Output bits can be combined to increase the max. load current. Low level and high level programming support. Free technical support; extended support available. This exciting product comes with one analog output channels and 4 TTL/CMOS channels, all independently controlled and synchronized. The analog channel can output RF/IF frequencies down to programmable DC levels. By providing multiple options, PulseBlasterDDSTM can be your complete excitation device for NMR, NQR, MRI, or related resonance and test technologies. If more output channels are required, multiple boards can be synchronized to provide as many digital output bits or RF/IF channels as necessary. The frequency and phase of the RF pulses generated by the DDS output channel are under the complete control of the user and are specified through software programming. Digital sampling rates of the output waveforms up to 300 MHz are supported. PulseBlasterDDSTM can be triggered and/or reset externally via dedicated hardware lines. The two separate lines combine the convenience of triggering (e.g., in cardiac gating) with the safety of the "stop/reset-to-zero" line. The required control signals are active low (or short to ground). The design also allows for multiple boards to be synchronized, easily extending the available output pattern to more bits and/or more RF/IF channels. The "Wait-for-event" feature is standard. Complete high IF digital excitation system for high field NMR/MRI (just add mixers!). Complete bench test equipment for solid-state NMR probes (just add mixer and power amplifier!) - eliminates the need for wasting the precious magnet time. Build a multi-qubit NMR quantum computing device at a fraction of the cost of other solutions. Use it for all-digital CRAMPS, SFAM, and other "exotic" solid-state NMR experiments. Use it for Senior-Project and Masters' classes. Use with your microcoil probe. Build and control your own equipment for "hyphenated" experiments, LC-NMR, etc. Spin-Decoupler. Autonomous, pre-programmed RF generator customized for NMR/MRI decoupling applications. To simplify the pulse-sequence programming, WALTZ and MLEV decoupling sequences are hard-coded via firmware and can be selected with an external TTL signal. The RF output frequency and pulse lengths can be controlled via a simple ASCII RS232 serial interface. The RF output power is approx. 10 dBm. Clock Generator. Single square-wave output of DDS-derived frequencies, 32 bits of frequency precision (141 mHz at 300 MHz reference oscillator frequency), may be used for driving digital systems as a digital clock generator; simplified programming interface. Stand-alone system USB (or RS-232) controlled. To complement the power and performance of the PulseBlasterDDSTM board, the software programming of the board is straightforward. The programming architecture, based on the Very-Long-Instruction-Word (VLIW) concept, assures that all RF and DAC events are always properly synchronized with the timing control signals generated by PulseBlasterTM pulse programmer core. The 32k memory depth and powerful flow control statements allow the most complicated patterns/sequences to be executed with ease. The PulseBlasterDDSTM board can run under Microsoft Windows operating systems, including XP. The control software can be compiled to operate under other operating systems as well. Interfaces and examples - LabView and Function Generator GUI. 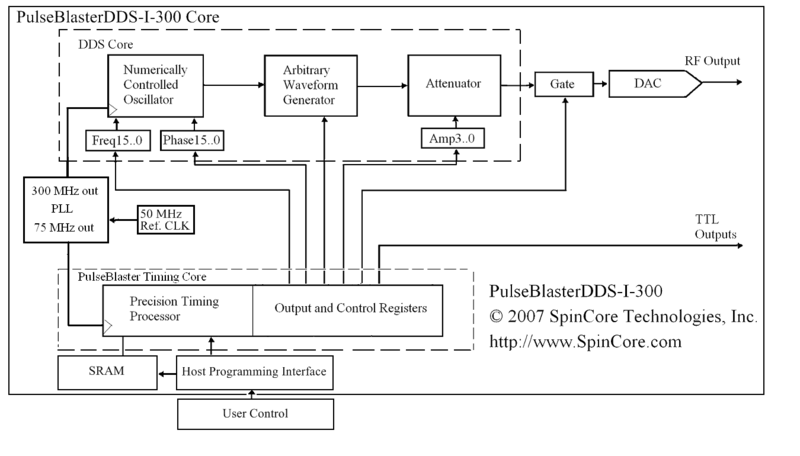 This is a demonstration of the simultaneous frequency and amplitude sweeping capabilities of the SpinCore Technologies' PulseBlasterDDS-I-300. The video shows a chirped pulse with a frequency sweep from 80 to 2 MHz and a Gaussian amplitude profile.